To say that life began two weeks ago might sound somewhat cliché for a 37 year old, yet as I put pen to paper for the first time in an unforgivably long time, with nothing to bother me at all but the distant sound of a playing child and the faint whirring of my time-lapse processing laptop, I cannot describe how I feel any other way. Today I find myself enveloped by the comforting arms of Pamplona, a place I know of only through its ancient tradition of bull running and a vague memory that Ernest Hemingway once lived here. I am here because it is the first city between St Jean Pied de Port in France and Santiago, some 800k away on the other side of Spain. I have had the strangest yet reassuringly pleasant sensation since arriving that I have been here before. It is something close to the feeling of coming home after a long time away. Perhaps in another life I lived within the security of these walls, for inexplicably I instantly seemed to know my way around. And honestly, even after quite some time in a place, this is a quality I am not usually associated with. The story of how I arrived here is certainly a story of note, and one I would like to tell, but this will remain for the moment the story of my present, not my past. So, to Pamplona. And that warm feeling of misty recognition. Of all the streets that my bare feet have trodden, these are unquestionably the most comfortable. The cobblestones are large and warn and more than this they are perpetually clean. Every morning at the respectable time of 9am a water truck hoses down the preceding nights dirt into carefully placed gutters. Inside the huge walls of this once impenetrable city no street is left unwashed and my feet & I remain eternally grateful. This morning I opened my door to what is usually a quiet, narrow back road to be greeted by the sounds & colours of a marketplace. The thick scent of firecrackers and upbeat hooting of a wind band filled my sluggish morning senses with information and a smiling woman not more than a few steps from my door sells me a tube of her homemade fluoride-free salvia toothpaste. She tells me that every street in the city has its one day of the year when it becomes a market street party, like a birthday celebration. How wonderful that I should catch the day of joy for the street in which I am staying. Fortuitous? Perhaps. After everything I have been through to get here, coincidences designed to enhance my enjoyment of the moment are nothing short of commonplace. Traditions seem to rule the various cultures of this planet and this place is no exception. Coffee, cigarettes and alcohol are fairly universal to Europe but it is rare, certainly in the UK to see grey haired ladies puffing away outside every bar, sipping on beer or vino tinto well before lunch time. With tradition comes a pride that seems as unflinching as these city walls. The people here run with bulls because this is what they have always done. There is no competition during the week of running. No winner to uphold. Only the chance to run alongside an animal made of muscle. A petrified beast with intent and ability to crush your bones in an instant. Identical red on white outfits are worn by all in attendance, runners and non runners alike. Despite the annual certainty of brutal injuries, there has not been a human death for many years. It seems sad to me however that the same cannot be said for the bulls. The weekend begins on a Thursday night and the doesn't end until Sunday morning. The remainder of the week takes on a more somber shape and the popular bars and cafes no longer prevent movement through the streets, unless of course you are prepared to sift through hoards of upbeat, marijuana-scented youngsters, which frankly, I quite enjoyed. The tradition on Thursday night is something similar to the English bar hopping concept, only it involves the local version of tapas, known here as pintxos, pronounced pinchos . Each bar, and there are many, prepares a wonderful display of their intricately designed pintxos, protected behind glass. The competition between bars is evident in the quality of both presentation and taste. As a vegetarian it is almost impossible to sufficiently nourish myself here, especially when taking part in the Thursday festivities. 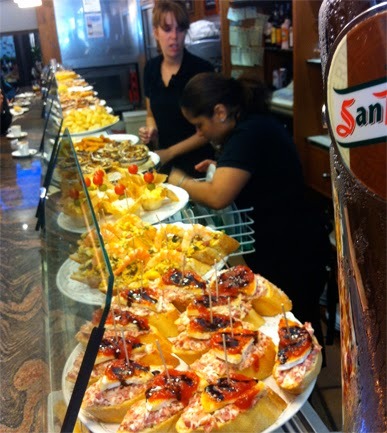 Almost all the pintxos feature the wafer thin cured ham of the region and the crunchy baguette-type bread. The baguette it seems has been hailed as the perfect accompaniment to every meal. I noted in the streets that every second person clutches one under their arm as if it were a fashion accessory to go with their already exquisitely stylish attire. I had hoped to buy some simple inexpensive closes here but the shops are not the kind in which a barefoot man feels comfortable. Within hours of arriving we had befriended a lovely Portuguese resident by the name of Carlos. Unshaven, paced and constantly smiling, he guided us around his favourite haunts and between the bar hopping snack treats and a long awaited joint overlooking the night lights of Pamplona, we had what I can safely describe as a night worthy of recollection. There is an energy that is hard to describe: an ancient buzz that moves from street to street with the sun. The bleached colours of the old buildings proudly adorned with flowers and flags are not fully appreciated until the streets have been trodden well, for each one comes to life at a different time of day, only when the sun creeps into the high walled pathways to illuminate their essence. The people seem happier here than the city folk I remember. Perhaps it is the free Pamplona wi-fi in every public square, or perhaps I wonder, as I listen to the sound of a skilled pianist playing Beethoven three floors up aside their open window at 11pm on a Tuesday night, perhaps they smile the way they do because this is what they have always done. With each passing moment I fall more and more in love with this place, yet with each passing moment I become more and more aware of the stark difference between those who live here and those who are just passing through. 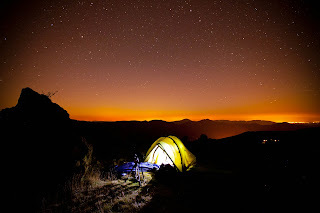 The clomping of expensive walking boots and brightly coloured heavy laden backpacks suspended behind tired yet excited eyes, relishing the first real taste of civilisation for over 50k, wondering where to eat and sleep. They are evident from a distance. And I see them because I am one of them. Or at least I was a week ago. We are known as peregrinos - pilgrims. And yes, we are only passing through. 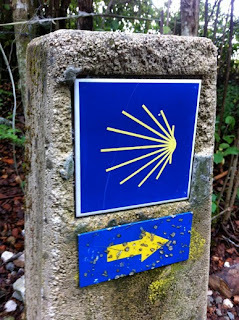 The road to Santiago has been trodden by many and as we well know, it is not the destination but the journey that enlightens the questioning mind. For this reason Pamplona offers only a single nights' refuge for most, before they rise in the darkness of a day yet begun to continue on with their search for what they hope will be answers. Unlike many of the peregrinos I have spoken to, I walk the Camino in search of nothing more than the joy and beauty I know is within me. And I am not in a hurry. For I already have everything I both want and need. With the alignment of happiness comes the alignment of our true creative nature and it has been an absolute joy to pick up where I left off in South Africa and get back to creating time-lapse again. I hope the film that Dominika and I have put together comes close to expressing the completeness of our experiences on this, the opening leg of the Camino de Santiago. And yes, travelling sweet traveling, you are the answer that makes my questions go away. I am grateful already for the road ahead.